The cost to build each 4′ x 8′ section is $250. The SBMA is entering this project in a grant competition through The Awesome Fund of South Bend . The South Bend Awesome Fund is dedicated to supporting people, ideas, businesses, and causes that will make the South Bend area even more Awesome! The Summer Quarterly Meeting will be held on Wed., Aug. 2 at The General Deli & Cafe from 6pm-8pm. The Awesome Fund will award three $1000 grants, and the meeting is open to the public. We are hoping to be one of the winners! 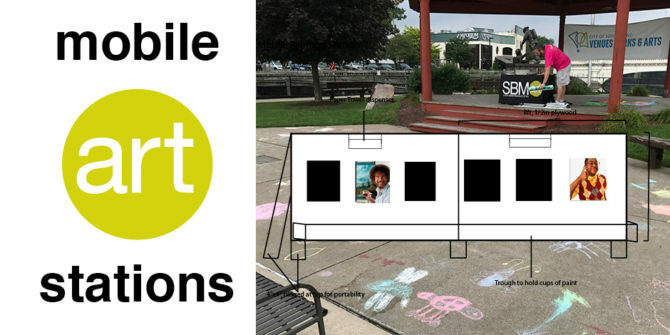 Look for news about our mobile art stations very soon! This entry was posted in For Families. Bookmark the permalink. Both comments and trackbacks are currently closed.